He is from a small village in Tirunelveli, TamilNadu (India). He is fun loving guy. He like to travel a lot. Bikes/Cars/Mobiles are his fantasies. He started his career as a BPO Data Entry Assistant and got chance to work as an ASP.NET Programmer in the same company after a year. And he move to the next company in 2006 as Software Engineer. 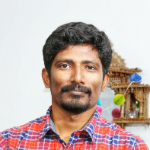 He worked as a Team Leader in a private software development company @Chennai, India for 8+years. Now working as a Consultant @Sydney, Australia. Hey man, your new profile picture looks good. Btw which location? You welcome, but you didn't answer my question. Are you afraid of your family for this? Are you afraid of your family for this? This shows that you haven't checked my FB pictures. I suggest you to see all my FB photo albums and dare to say "Afraid". But still you didn't give me access to your secret albums. I had no chance to a secret till this millisecond. And I don't think there would be any..
Why do some people get all the luck while some don't get the breaks they deserve? Ten years ago, I set out to examine luck. I wanted to know why some people are always in the right place at the right time, while others consistently experience ill fortune. I placed advertisements in national newspapers asking for people who f elt consistently lucky or unlucky to contact me. Hundreds of extraordinary men and women volunteered for my research and over the years, I have interviewed them, monitored their lives and had them take part in experiments. The results reveal that although these people have almost no insight into the causes of their luck, their thoughts and behavior are responsible for much of their good and bad fortune. Take the case of seemingly chance opportunities. Lucky people consistently encounter such opportunities, whereas unlucky people do not. I carried out a simple experiment to discover whether this was due to differences in their ability to spot such opportunities. I gave both lucky and unlucky people a newspaper, and asked them to look through it and tell me how many photographs were inside. I had secretly placed a large message halfway through the n ewspaper saying: "Tell the experimenter you have seen this and win Â£250." This message took up half of the page and was written in type that was more than two inches high. It was staring everyone straight in the face, but the unlucky people tended to miss it and the lucky people tended to spot it. Unlucky people are generally tenser than lucky people, and this anxiety disrupts their ability to notice the unexpected. As a result, they miss opportunities because they are too focused on looking for something else. They go to parties intent on finding their perfect partner and so miss opportunities to make good friends. They look through newspapers determined to find certain types of job advertisements and miss other types of jobs. Lucky people are more relaxed and open , and therefore see what is there rather than just what they are looking for. My research eventually revealed that lucky people generate good fortune via four principles. They are skilled at creating and noticing chance opportunities, make lucky decisions by listening to their intuition, create self-fulfilling prophesies via positive expectations, and adopt a resilient attitude that transforms bad luck into good. Dramatic results These exercises helped them spot chance opportunities, listen to their intuition, expect to be lucky, and be more resilient to bad luck. One month later, the volunteers returned and described what had happened. The results were dramatic: 80% of people were now happier, more satisfied with their lives and, perhaps most important of all, luckier. The lucky people had become even luckier and the unlucky had become lucky. Finally, I had found the elusive "luck factor"
Â· Visualize yourself being lucky before an important meeting or telephone call. Luck is very often a self- fulfilling prophecy. The science behind getting lucky is thus, simple. Luck is what happens when preparation meets oppurtunity. So work hard.. and firmly believe that you'll make the cut.. The worried Preeto sprang to the telephone when it rang and listened with relief to the kindly voice in her ear. "How are you, darling?" she said. "What kind of a day are you having?" "Oh, mother," said Preeto, breaking into bitter tears, "I've had such a bad day. The baby won't eat and the washing machine broke down. I haven't had a chance to go shopping, and besides, I've just sprained my ankle and I have to hobble around. On top of that, the house is a mess and I'm supposed to have two couples to dinner tonight." The mother was shocked and was at once all sympathy. "Oh, darling," she said, "sit down, relax, and close your eyes. I'll be over in half an hour. I'll do your shopping, clean up the house, and cook your dinner for you. I'll feed the baby and I'll call a repairman. I know who'll be at your house to fix the washing machine promptly. Now stop crying. I'll do everything. In fact, I'll even call Ashok at the office and tell him he ought to come home and help out for once." "Ashok?" said Preeto. "Who's Ashok?" "Why, Ashok! Your husband...Is this 2369125? There was a short pause and Preeto said, "Does this mean you're not coming over?" "Learn to smile at every situation. See it as an opportunity to prove your strength and ability." But there is a latent thought too. People are so eager to leave their responsibilities to others, relax but reap the benefits alone!